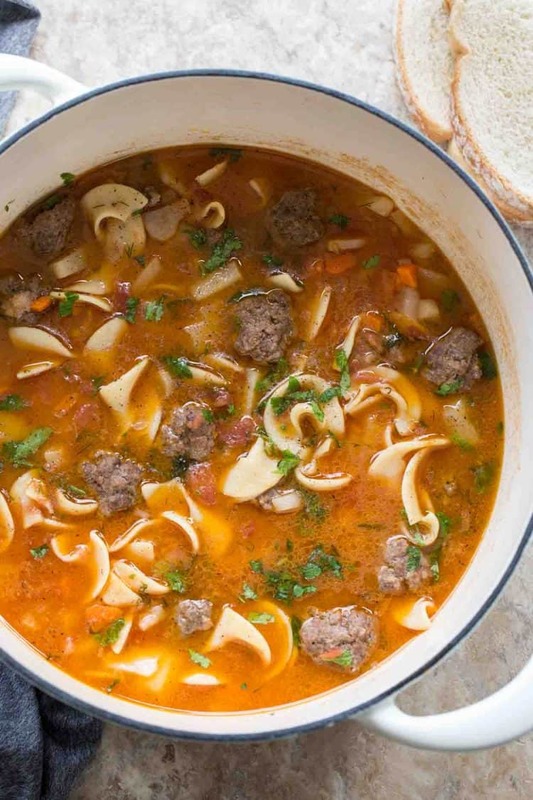 This homemade Meatball Soup Recipe is the ultimate comfort food. Egg noodles with meatballs and potatoes in a delicious broth, the perfect bowl of soup ready in 30 minutes. When you think of meatballs, you typically think spaghetti. 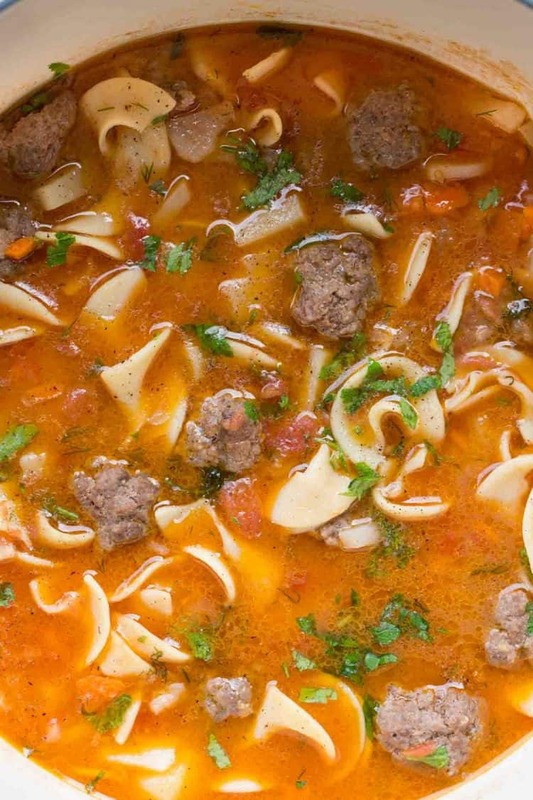 This soup recipe will change that thinking of meatballs can be so versatile. 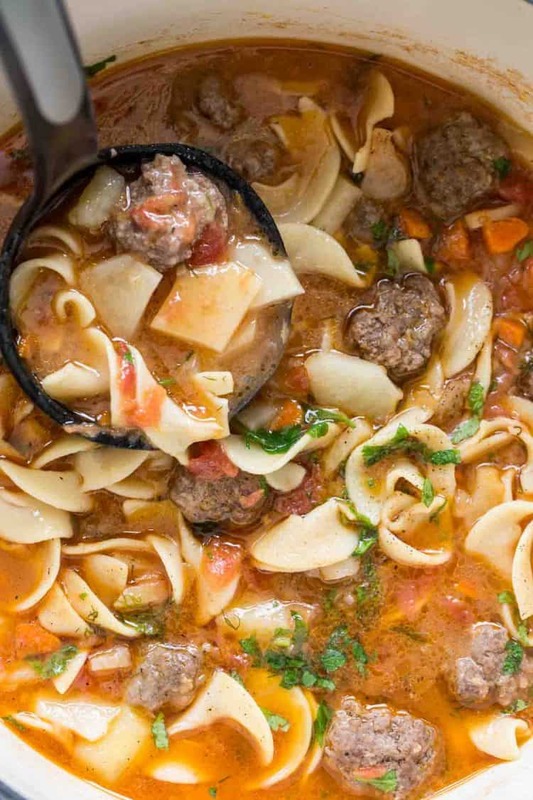 This noodle soup is loaded with homemade meatballs, potatoes and carrots in a flavorful broth. It’s so hearty (kind of reminds me of our Borscht), it hits the spot when soup cravings kick in. This noodle soup is kind of like a chicken noodle soup but with ground pork as the protein, added veggies and potatoes. It’s so easy to make. 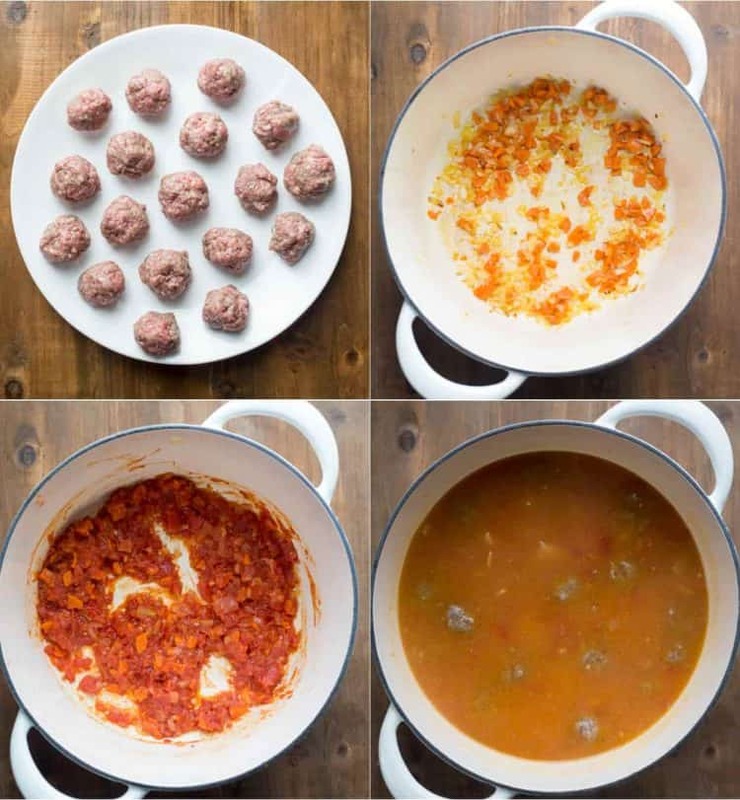 In a bowl, combine the ingredients for the meatballs. Combine the ground meat, grated onion, garlic and season with salt and pepper. NOTE: We used ground pork in this recipe, you can substitute for ground beef, turkey or chicken. In a Dutch oven or pot with a thick bottom, saute onions with oil and butter until tender. Add cubed carrots, saute over medium heat until carrots are tender. Add diced tomatoes and minced garlic, stir to combine and cook about 3 minutes. Pour in the water, broth and diced potatoes. Bring to a soft boil. Once boiling add the noodles and season with salt and pepper. Cook five minutes and add in meatballs. Turn heat down and cook until potatoes are tender and meatballs are cooked. Add favorite herbs and serve. I hope you make this homemade noodle soup and love it as much as we do. The kids especially love the combination of noodle and soup. Pasta Fagioli Recipe– Olive Garden copycat recipe. Creamy Tomato Soup– with grilled cheese. Zuppa Toscana– a family favorite. 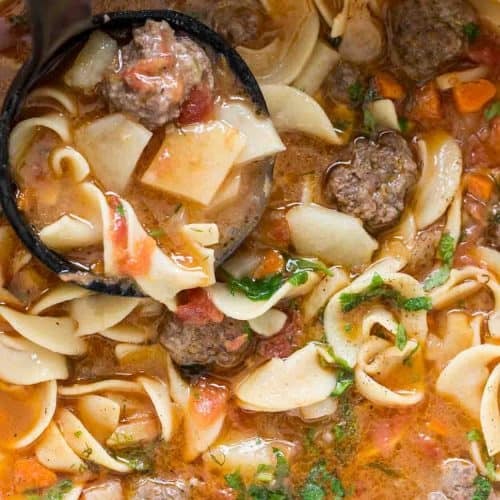 Delicious homemade noodle soup with homemade meatballs, potatoes, vegetable in a broth, ready in 30 minutes. Pure comfort food. In a Dutch oven, over med heat, sauté onions with oil and butter, until almost tender. Add cubed carrots, saute until almost cooked. Add in diced tomatoes and minced garlic, cook for 3 minutes, stirring frequently. Once boiling, add the noodles and season with salt and pepper. Cook 5 minutes and add in meatballs. Cook until potatoes are tender and meatballs are cooked. Add favorite herbs and serve.